Dental implants by the dentist at Woodbury Dental and Laser Clinic are artificial tooth roots that provide ideal solutions for missing teeth. Those who are suffering from missing teeth problems do not need to endure the multitude of problems that are caused by tooth loss, as dental implants can effectively bring back the quality of life they deserve – so smiles can be bright (and complete) once again. Dental implants are attached to dental crowns, which can bring back the lost smiles that came with missing teeth problems. There are various types of dental implants by the dentist at Woodbury Dental and Laser Clinic in Kent; however, the most commonly placed ones throughout the world are often described as endosseous, or root-form implants. These types of dental implants have a cylindrical form and may be threaded on the outer surface to facilitate the implant placement. 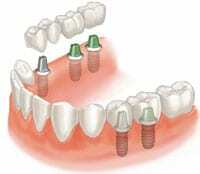 Other dental implants designs include blades or subperiosteal implants. The success and rapid growth in popularity of the root-form dental implant is mainly due to its predictable behavior, especially when trying to achieve a firm attachment with the surrounding bone, and the maintenance of this state throughout many years of function. Dental implants can only be successfully placed by the dentist at Woodbury Dental and Laser Clinic if there is enough jaw bone mass in the area where teeth have gone missing. When teeth are lost, the bone around the teeth gradually deteriorates in structure, leaving no stable base for the dental implant to be attached to. If too much bone has been lost, bone grafting procedures may be done to encourage the growth of new bone tissue. Improved Aesthetics – Missing teeth can adversely affect the appearance of one’s smile. As dental implants replace the form of missing teeth, they can help in maintaining the symmetry of a person’s smile. The dental implants by the dentist at Woodbury Dental and Laser Clinic are also effective in closing the gaps created by tooth loss, and can prevent the facial tissues from sagging or appearing as sunken – which can make a person look older. Improved Speech – A person who has missing teeth will find it difficult to speak in a clear manner – especially if the lost teeth are located in the front part of the mouth. Dental implants make it possible for a person who has missing teeth to be able to speak clearly once more – without any difficulties in proper word enunciation. Improved Chewing/Eating Capability– It is very difficult for a person who has missing teeth to chew or eat properly. Dental implants restore the form and function of missing teeth, so it will again be possible for a person to enjoy meal times without any embarrassing or excruciating chewing episodes. Prevention of Jaw Bone Loss – Missing teeth can result to the deterioration of jaw bone structure. Dental implants by the dentist at Woodbury Dental and Laser Clinic prevent the bone deterioration from happening, especially if the implants are placed within a short period of time after the teeth have gone missing; this is because the implants replace the function of the tooth root, and stops further bone loss or deterioration in the area where there is tooth loss. If the amount of bone on the sinus area is adequate, some surgeons prefer to place the implants at the same time as the grafting procedures. Whatever type of bone is added augment the area where the implant will be placed, it must be given time to integrate with the surrounding tissues – before the dental implants can successfully be placed. If the implants are placed as a secondary procedure, (depending on the amount of bone being grown and the nature of the graft material used), they can be inserted after four to nine months; this depends on the length of time that the graft material needs to fully be integrated with the surrounding tissues. As with other bone grafting procedures, the implants are left to become firmly attached to the surrounding bone tissues. There is usually a slightly extended healing period chosen – with an average of six to nine months – before the tooth restoration (such as dental crown, dental bridge, or dentures) are fitted. However, the length of time necessary before the restoration can be fitted will depend on the specific individual’s case. Missing teeth can often be replaced by implants. Implants act like roots of teeth. After they have been fitted and have healed in place, dentures or crowns may be attached to them. When dentures are held in place by implants they do not slip around. 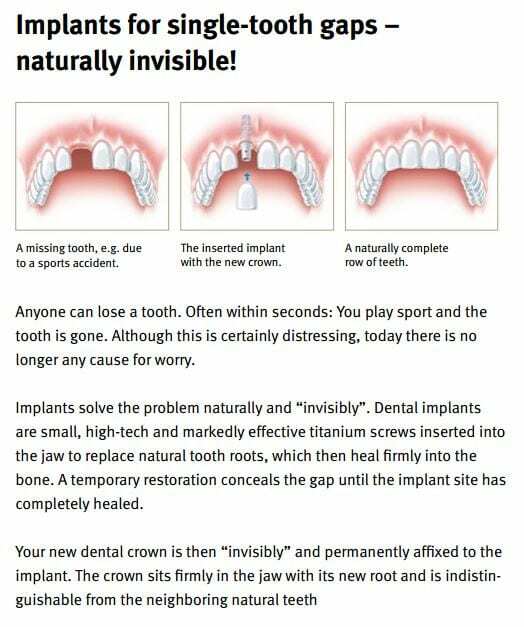 If crowns are fitted on implants they act like normal teeth. There are various types of implants, however, the most commonly placed throughout the world are often described as root-form or endosseous implants. These generally have a cylindrical form and may be threaded on the outer surface to assist placement. Other designs such as blades or subperiosteals whilst in use by some practitioners are not the focus of this information. The success and rapid growth in popularity of the root-form implant is largely due to its predictable behaviour when trying to achieve a rigid fixation with the surrounding bone and the maintenance of this state throughout many years of function. Implants can only be placed if there is enough bone present in the jaw. When teeth are lost, the bone around the teeth gradually disappears. If too much bone has been lost it is sometimes possible to grow bone in its place. To plan the most suitable treatment certain information is helpful for example photographs, x-rays, models of your teeth and jaws. In some circumstances, a more comprehensive three-dimensional x-ray evaluation using a CT Scan may be requested to give greater detail of the shape of your jaws. The conventional x-ray views most familiar to patients are only 2-dimensional and subject to varying degrees of distortion and inaccuracy. Where important anatomical structures must be avoided, the information they provide may therefore be inadequate. The CT scan in contrast can provide life-sized 3-dimensional information of all regions of the upper and/or lower jaw from which precise measurements can be taken for pre-operative treatment planning. In some cases the CT scan may also be used to evaluate the results of bone grafting procedures prior to placing implants. Implants survive best in a healthy environment. Any tooth decay or gum problems need to be corrected before implants are placed to give them the best chance of success. Gum Health: This may involve the use of special brushing methods, flossing, tooth picks and small “bottle” brushes. Some gum treatment may be necessary. Removal of Unsavable Teeth: Despite advances in modern dentistry some teeth may have reached a stage when no treatment can save them. It is often best to remove them at an early stage, particularly if you are thinking of having implants so as to prevent further bone loss. Treat or remove all pre-existing oral infection wherever possible. The success of implant therapy can be seriously affected by infections resulting from failed gum or root canal treatments or untreated gum disease or nerve problems in sites adjacent to implants. Long-standing infections of the soft-tissues beneath dentures can also adversely affect healing at the various surgical stages. Your treatment may be delayed whilst these areas are resolved. Although gum infections arising in opposite jaws have no clearly proven link with problems around implants, there is at least the theoretical risk of bacterial transmission, therefore for the meantime it would be considered prudent to assume that there is a risk. Your mouth should be treated as a whole and not simply as unrelated regions. As a general principle, as many implants as possible should be used. This allows the stresses of biting to be spread over the maximum number of implants, thus diminishing the load on each particular one. Some people find it more convenient to proceed in stages. It is sometimes possible to have two or three implants placed, use them for a while and some time later, add more implants to improve the treatment plan. This is not an approach which is feasible in all situations and is probably most suited for treatment of the lower jaw where no teeth are present. An example of this might be the patient with no teeth in the lower jaw who has two or more implants placed in the first instance. By stabilizing their denture using the implants, it can be held more firmly in place. Later on, if they have sufficient bone, more implants can be added and eventually fixed-teeth placed on the implants eliminating the denture altogether. A number of the implant systems available today could support this approach, however the feasibility of upgrading should be confirmed by all parties rather than assumed. What is it Like Having Implants Fitted? Generally speaking, having implants fitted is not at all painful. For apprehensive patients, sedation can be given making the procedure quite comfortable. What is it Like After Having the Implants Placed? The after-effects of having implants placed are usually mild and may include slight bruising, dull ache, and swelling, the amount of which will vary dependent upon the number of implants placed and the difficulty of the surgical procedures. When choosing a date for implant placement avoids significant social engagements and work commitments for at least a week after. This is just to be on the safe side. Taking time off work is not usually necessary. It is a natural phenomenon that after teeth have been removed the bone that once supported them slowly resorts away. This occurs faster when prolonged gum problems have been present or poorly fitting dentures are being worn. The result is that there is sometimes not enough bone to support implants. When there is not enough bone present, it may be necessary to create new bone to fill in missing areas allowing implants to be fitted. A variety of techniques are available to do this and these are referred to as ‘bone grafting’. The bone used in these situations may be specially treated donor material from a ‘Bone Bank,’ a synthetic substitute, or taken from areas in the mouth where there is some spare. In special cases where larger amounts of bone are needed it is possible to move bone from other places such as the hip or shin to the deficient area of the mouth. The area from which the bone is taken will regroup. Where the clinical conditions indicate that bone grafting is required to increase the amount of bone into which implants are placed it will generally increase the time taken to complete treatment. Under routine circumstances where no bone grafting is required the implants are commonly ready to begin function between 3 and 6 months later. If the bone grafting can be undertaken at the same time that implants are placed, treatment is more likely to take 6 to 12 months. Where implant placement must be delayed until after maturation of the bone graft, overall treatment may take 12 to 18 months. A Technique Call ‘Guided Tissue Regeneration’ has also Shown Considerable Success where the Amount of Bone at the Intended Implant Site is Less than Ideal. When a tooth is removed a hole in the gum and bone remains for the first few weeks. Anyone who has lost a tooth or had an extraction knows that this generally heals uneventfully, and eventually you cannot tell where the tooth was. The basic principle behind ‘guided tissue regeneration’ is that placing a special membrane over the extraction socket creates a layer above which the fast growing soft tissue cells are prevented from entering the bony socket. This allows bone cells present beneath the membrane the extra time they need to fill the socket without competition from soft tissues to occupy the same space. It is very common to find that the softer bone in the area above the upper back teeth (molars and sometimes premolars) is very shallow and not suitable for normal implant procedures. To solve this problem a procedure knows as a ‘sinus augmentation’ or ‘sinus lift’ was developed. Bone may be successfully grown in the sinus spaces above your upper back teeth allowing implants to be placed. Specially treated donor bone from a ‘Bone Bank,’ synthetic bone substitutes, or bone from other areas of the mouth or body is placed into these empty areas. Over a period of time this is replaced by new bone thus providing a bed into which implants can be fixed. If the amount of bone overlying the sinus is adequate, some surgeons prefer to place the implants at the same time as the grafting procedures. Whatever type of bone is added to the sinus it must be left to mature before implants are placed or brought into function. If the implants are placed as a secondary procedure, (depending on the amount of bone being grown and the nature of the graft material used), they can be inserted after four to nine months, although occasionally it may be necessary to wait longer. As with other bone grafting procedures the implants are left to become firmly attached to bone. 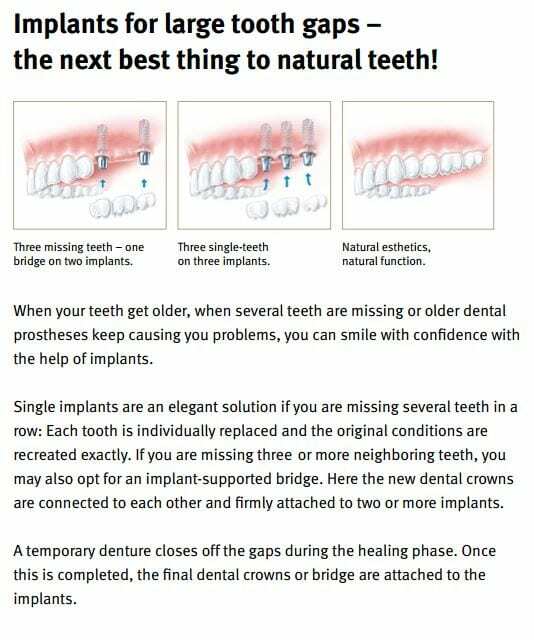 Commonly a slightly extended healing period is chosen with an average of six to nine months before a denture or crown and bridgework is fitted. However, all bone grafting is unique to each individual and this information is for guidance only. Despite the thoroughness of the planning, extra procedures are sometimes required during treatment to produce the best results. It is important that in this event you accept that appropriate alternative treatment is performed at the time of treatment although it may be different to that already planned. Alternative procedures required due to changes in the treatment plan. Sometimes bone may be lost around an implant. There are techniques available to treat these problems if the cause can be identified. In some situations however, progressive bone loss might result in the loss of the implant. Implantology is a rapidly advancing science. We may take advantage of some of the new procedures or materials as they become available if they promise to significantly improve the outcome. Alterations to your original plan may therefore be made during your treatment. This depends on the complexity of the treatment. Initially there is a treatment planning stage which may last a month or so. Then there may be some time spent on such preparatory procedures as improving gum health, removing any unsavable teeth and growing bone. This may take anything from a few weeks to many months. Special medication will be prescribed for you to help healing and produce minimal discomfort. To gain the most benefit please follow the instructions given. It is important that neither the patient nor the implant provider attempt to rush the treatment or try to advance the various stages faster than the time required for complete healing and maturation of bone and soft-tissues. Your implant provider may suggest that procedures to grow bone are undertaken separately from placing the implants, even though under certain conditions it is possible to combine these stages. Wearing Dentures Immediately After Surgery? Denture wearers may require their dentures to be modified or be asked to leave them out for a period of time to prevent them resting on newly placed implants. During settling-in stages, metal framework dentures may need to be replaced with a plastic set as they are more easily adjustable. The fitting surface can then be altered when the implants are placed. If anything arises that you are concerned about, telephone immediately. Usually there is nothing to worry about, but no matter how apparently trivial, it is always better to check. Unlike teeth, implants cannot get tooth decay. However, like teeth, they can suffer from gum problems. Teeth with untreated gum problems can become loose and be lost. This is also true of implants. Thorough daily cleaning is as important with implants as it is with teeth. 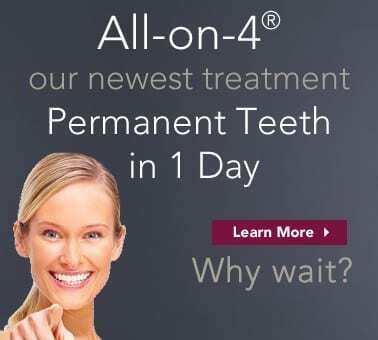 Implant Success and your Commitment to Long-Term Maintenance? To ensure that any problems are detected early, regular maintenance check-ups are advisable. Problems are more easily treated if detected early. Check-ups may be recommended three, four or six monthly. In most cases review appointments will be more frequent during the first year that the implants are in function. Regular check-ups are every bit as important as they are with natural teeth, if not more so. Porcelain crowns attached to implants can break as they can when attached to natural teeth. 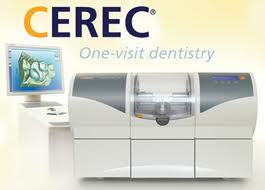 However, removal of crowns from implants for repair is usually easier than from natural teeth. 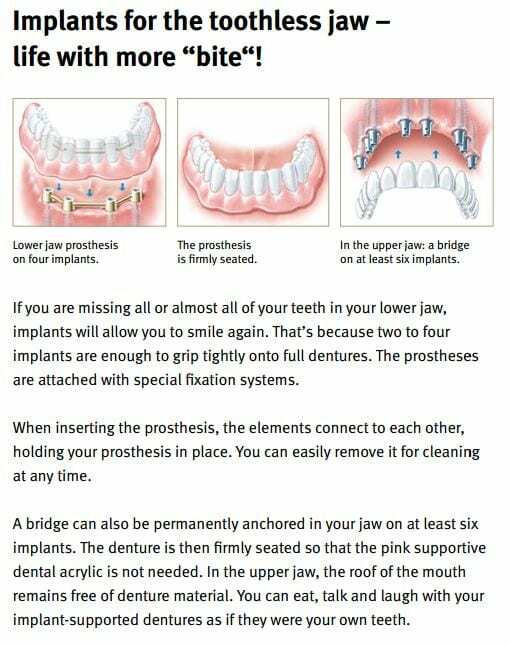 Implant supported bridges that become loose should be re-tightened immediately to reduce the likelihood of further unnecessary damage. Should it be discovered during a routine maintenance visit that an implant has failed or is failing, appropriate remedial action will be planned accordingly. Implants that become loose will not re-tighten and should be removed at the earliest opportunity. Should you notice any areas of soreness, discharge or pain on chewing near any implant or tooth you must immediately report this to the dentist responsible for your maintenance. Success depends on your body’s reaction to implants and your personal care of them. Implants can fail due to gum disease just as teeth do. Success is constantly improving due to improved techniques. Natural teeth last longer today as awareness of the need for looking after them becomes more accepted. However, there would not be a need for implants if teeth were totally successful. Both smoking and heavy alcohol consumption reduce the survival of implants (and teeth). If you think that either of these two habits could be a problem for you and your implants, it may be advisable to avoid this.